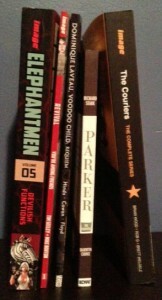 Unholy Fistful of Indie Comics, Creator-Man. On this ominous date of 12/12/12, I find myself carrying a stack of original and interesting and exciting comic books. Some of them are by a couple of my favorite creators in the industry and others are creators that I like to keep my twitchy-eye on. It’s days like this that make me happy to be reading and writing about indie comics – I can’t wait to dig into this pile of books.The Numero Uno book that I can’t wait to revisit is The Couriers: The Complete Series by Brian Wood, Rob G and Brett Weldele. It was soon after I came back to reading comics from a long hiatus that I’d been on, generally because I’d grown board of comics when I found The Couriers and more specifically, Brian Wood. This title was a part of a large chunk of books that I read during this time that made me excited about comics again, specifically indie comics. These books made me not only want to read comics but be part of the industry. So, it is with great pleasure and enthusiasm that I pull this collection of comics off the shelf for another perusal. Elephantmen. Richard Starkings. Two incredibly important names in the indie comics scene. Two inspiring names. First of all, Starkings is a really cool and insightful guy and it’s always awesome to see him at comic book conventions big and small, schilling his wonderful title, Elephantmen. This is another title that I read soon after my coming back to comics and Starkings truly inspired me to do what I love for long enough that maybe one day I’ll create/write something that might be half as good as Elephantmen. Read it. Dominique Laveau Voodoo Child: Requiem is my indulgent purchase for the day. I love contemporary dark fantasy and I hope to one day, more effectively launch my own title in this genre – maybe even in comics. So, when I saw the back of this book and it said, “Only one woman can stop the onslaught, unite the Voodoo Court, and reign over the supernatural beings who stalk the shadow side of the Big Easy….” Yeah, I had to buy it. Plus, uh, Denys Cowan has some wonderful art-stylings that I have a tough time passing up. Here’s to this title satiating my love for the dark. Speaking of contemporary dark fantasy, Tim Seely and Mike Norton’s Revival: A Rural Noir seems to be right down that dark and shadowy alley. Well, maybe. It’s apparently a rural setting so hopefully I’ll get some new twist on the dark urban fantasies that I love so much. The last book in my stack is Richard Stark’s Parker. This one is a fluke. I know there is a ton of hype around Darwyn Cooke and IDW can’t stop hyping this book to let chickens cross the road, oh, and according to the cover of this book, there is apparently a major motion picture on the way. But here’s the thing, I know very little about this book or any of the creators. I am, against my better judgement, buying and reading this title on good marketing alone – not something this marketing professional does often. Cross your fingers that it’s good cause everyone knows I don’t want to have to go against the general consensus again. This entry was posted in Columns and tagged axel medellin, boo cook, Brett Weldele, Brian Wood, comicraft, Darwyn Cooke, denys cowan, ed mcguinness, gregory wright, ian churchill, j scott campbell, john floyd, keu cha, nei ruffinu, Parker, richard stark, richard starkings, rob g, selwyn seyfu hinds, shaky kane, the hunter. Bookmark the permalink. Follow any comments here with the RSS feed for this post. Post a comment or leave a trackback: Trackback URL.